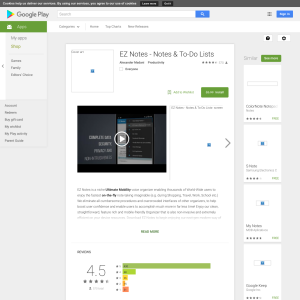 EZ Notes is a niche Ultimate Mobility voice organizer enabling thousands of World-Wide users to enjoy the fastest on-the-fly note-taking imaginable (e.g. during Shopping, Travel, Work, School etc.) We eliminate all cumbersome procedures and overcrowded interfaces of other organizers, to help boost user confidence and enable users to accomplish much more in far less time! Enjoy our clean, straightforward, feature rich and mobile-friendly Organizer that is also non-invasive and extremely efficient on your device resources. Download EZ Notes to begin enjoying our next-gen modern way of taking Ultimate Mobility "on-the-fly" Notes. We are confident you will find EZ Notes to be an exceptionally handy and indispensable daily tool. To-do lists, voice notes, reminder notes, diary notes, organizing notes, shopping list notes, sketched notes, wireless printing of notes, web services on notes, and PDF notes, are but a few example uses of EZ Notes Notes & To-Do Lists voice organizer! • Enjoy cross compatibility via: Email, Facebook, G+, Hangouts, and other Apps. Use our EZ Sketch S-pen features (courtesy of "Markers" by Daniel Sandler) to sketch notes, share notes & illustrate conceptual notes. • Find notes easily. Our EZ Folders are a bonus for organizing notes. You can also search notes by "priority coded" colors. Our "EZ Undo" function recovers up to 10 notes (not just 1 note). The Trash Bin automatically stores deleted notes for easy recovery of notes. • EZ Notes keeps your reminders and notes in your control. We don't endorse syncing notes as it: Invites App instability and bloat, exposes notes to Hackers, requires an internet connection, and strains smartphone resources. When necessary to Backup / Transfer notes, use "EZ-Export." This useful function transfers notes between devices, shares notes to other apps, and can backup notes to Google Drive.